Updated September 26, 2019, to include changes in undergrad business and engineering rankings. Quite a few changes, especially in business. Other U.S. News departmental rankings are done in alternate years, so we will begin designating the disciplines as “Current” instead of listing a year. This list includes the top 50, rather than the top 30, public university academic departments in each of 15 disciplines. Business and engineering (undergrad) rankings are included, as are graduate rankings for education, economics, English, history, political science, psychology, and sociology. One interesting feature of the U.S. News rankings is an assessment of academic departments within each national university, both public and private. The magazine reports undergraduate rankings for business and engineering departments, and lists graduate-level rankings for those departments and many others. The magazine does not change the grad program rankings each year. The lower the number is, the higher the average departmental rank will be. Rankings for graduate programs are a good indication of the quality of undergraduate programs at the same university, although graduate rankings in some subjects, such as business, can vary significantly from undergraduate assessments. The departments included here, other than undergraduate business and engineering, are the following graduate departments: biological sciences, chemistry, computer science, earth sciences, economics, education, English, history, math, physics, political science, psychology, and sociology. These departmental rankings can be important in choosing an honors program or college, but they should not be determinative, because the quality of undergraduate instruction may be better at universities that do not have the intensive focus on research that is so important to graduate rankings. 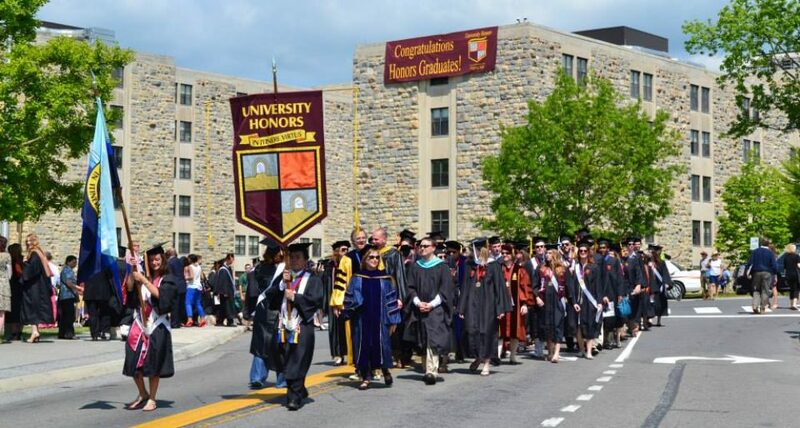 Choosing an honors program or college requires not only an assessment of academic strength but also a personal sense that the honors program or college itself is centered on undergraduate excellence and achievement. Most of the public institutions listed below do have good to excellent honors programs that bring more focus to undergraduates. The figures below reflect national rankings for public and private universities, though only public universities are listed. Clearly, the peer assessment of academic disciplines is only one measure that might assist in making a college choice. Some outstanding colleges do not score remarkably high in peer assessments because they are not so research oriented. Among these, both public and private, are Virginia, Georgetown, Notre Dame, Emory, Wake Forest, and Notre Dame. Please see Rankings Academic Departments Private Elites vs Publics for more comparisons. We hope to update the public/private comparisons in the near future. Business (undergrad)–(2019): UC Berkeley (2); Michigan (4); UT Austin (6); North Carolina (8); Virginia (8); Indiana (10); Ohio State (15); Illinois (18); Minnesota (18); UW Madison (18); Arizona (21); Georgia (21); Georgia Tech (21); Maryland (21); Michigan State (21); Penn State (21); Purdue (21); Washington (21); Arizona State (30); Florida (30); Texas A&M (30); Colorado (35); Iowa (35); UC Irvine (35); Pitt (35); Alabama (44); Arkansas (44); Florida State (44); Georgia State (44); Massachusetts (44); Nebraska (44); Oregon (44); South Carolina (44); UC San Diego (44); Utah (44); Virginia Tech (44); William and Mary (44). Here are undergrad business rankings, by specialty, public and private, in one post. Biological Sciences (Current): UC Berkeley (1); UC San Diego (16); UC Davis (18); UCLA (18); UW Madison (18); Michigan (23); Washington (23); Illinois (27); UT Austin (27); Colorado (33); UNC-Chapel Hill (33); UC Irvine (33); Indiana (39); Minnesota (39); Ohio State (39); UC Santa Barbara (39); Arizona (46); Georgia (46); Michigan State (46); Penn State (46); Pitt (46); Virginia (46). Chemistry (Current): UC Berkeley (2); Illinois (6); UW Madison (9); Michigan (15); North Carolina (15); UCLA (15); UT Austin (15); Texas A&M (24); Georgia Tech (20); Penn State (20); UC Irvine (20); UC San Diego (20); Colorado (24); Minnesota (24); Washington (24); Purdue (24); Ohio State (30); Indiana (32); UC Davis (32); UC Santa Barbara (32); Utah (32); Pitt (39); Florida (41); Arizona (41); Maryland (41); Iowa State (48); Michigan State (48); Virginia (48). Computer Science (Current): UC Berkeley (1); Illinois (5); Washington (6); Georgia Tech (8); UT Austin (10); Michigan (11); UCLA (13); UW Madison (13); Maryland (16); UC San Diego (16); Massachusetts (20); Purdue (20); North Carolina (25); Minnesota (29); Ohio State (30); Penn State (30); UC Irvine (30); Virginia (30); Rutgers (37); Stony Brook (37); UC Davis (37); UC Santa Barbara (37); Arizona (40); Colorado (40); Virginia Tech (40); Texas A&M (43); Utah (43); Arizona State (43); NC State (43); Florida (49); Pitt (49). Earth Sciences (Current): UC Berkeley (2); Penn State (5); UT Austin (7); Arizona (8); Michigan (10); Washington (10); UCLA (13); Arizona State (15); UC San Diego (15); UW Madison (15); Colorado (19); UC Santa Cruz (19); UC Santa Barbara (19); Minnesota (24); UC Davis (24); Colorado School of Mines (28); Maryland (28); Virginia Tech (28); Illinois (31); Oregon (31); Oregon State (31); Texas A&M (31); Georgia Tech (38); Ohio State (38); Stony Brook (38); Hawaii (41); Purdue (41); UC Irvine (41); Utah (41); Indiana (42); Massachusetts (46); New Mexico (46); NM Inst of Mining and Tech (46); Wyoming (46). Economics (Current): UC Berkeley (1); Wisconsin (12); Michigan (12); UCLA (12); UC San Diego (12); Minnesota (16); Maryland (21); Penn State (25); UT Austin (27); Michigan State (29); Ohio State (29); Illinois (29); North Carolina (29); UC Davis (29); Virginia (29); Washington (35); UC Santa Barbara (37); Indiana (39); Pitt (39); Texas A&M (39); Arizona State (42); Arizona (42); Iowa (42); Purdue (42); Rutgers (47); UC Irvine (47); Colorado (50). Education (Current): UCLA (1); UW Madison (2); Washington (9); UT Austin (10); Oregon (13); Michigan (14); Arizona State (15); Virginia (16); Kansas (17); Minnesota (19); UC Berkeley (19); Michigan State (22); Ohio State (23); Florida (24); UC Irvine (24); Va Commonwealth (26); Illinois (27); Utah State (27); Colorado (29); Connecticut (30); Indiana (30); North Carolina (31); Maryland (33); Texas A&M (37); Delaware (34); Pitt (34); Georgia (37); UC Davis (37); Penn State (38);Georgia State (40); Iowa (40); Nebraska (40); Massachusetts (41); Purdue (43); Rutgers (43); NC State (46); Arkansas (46); Kentucky (46); Missouri (46). Engineering (undergrad)—(2019): UC Berkeley (3); Georgia Tech (4); Illinois (6); Michigan (6); Purdue (9); UT Austin (9); Virginia Tech (13); Texas A&M (14); UW Madison (14); UCLA (18); UC San Diego (18); Washington (18); Maryland (24); Minnesota (24); Penn State (24); Ohio State (30); Colorado (32); Florida (32); NC State (32); UC Davis (32); UC Santa Barbara (32); Arizona State (38); Virginia (38); Colorado School of Mines (43); Iowa State (43); UC Irvine (43); Michigan State (48); Pitt (48); Rutgers (48). Here are engineering undergrad rankings, by specialty, public and private, in one post. English (Current): UC Berkeley (1); Virginia (6); UCLA (6); Michigan (8); Rutgers (15); UC Irvine (17); North Carolina (18); CUNY Graduate Center (20); Indiana (20); UC Davis (20); UT Austin (20); UW Madison (20); Illinois (26); Penn State (27); UC Santa Barbara (27); Maryland (30); Ohio State (30); Colorado (35); Illinois Chicago (35); Pitt (35); UC Santa Cruz (35); Washington (35); Iowa (42); Minnesota (42); U at Buffalo (42); UC San Diego (42); Oregon (47); UC Riverside (47). History (Current): UC Berkeley (4); Michigan (6); UCLA (9); UW Madison (9); North Carolina (11); UT Austin (16); Virginia (18); Indiana (20); Rutgers (21); Illinois (23); Washington (23); Maryland (27); Ohio State (27); William and Mary (27); Minnesota (32); UC Davis (32); CUNY Graduate Center (34); UC Irvine (34); Colorado (38); Kansas (41); UC San Diego (41); George Mason (44); Georgia (44); Massachusetts (44); Michigan St (44); Penn State (44); Pitt (44); UC Santa Barbara (44). Math (Current): UC Berkeley (2); UCLA (7); Michigan (12); UT Austin (14); UW Madison (16); Illinois (19); Minnesota (19); UC San Diego (19); Maryland (22); Rutgers (22); Georgia Tech (26); Ohio State (26); Purdue (26); Stony Brook (26); Washington (26); Penn State (32); Indiana (34); North Carolina (34); UC Davis (34); Utah (34); Illinois Chicago (39); Texas A&M (39); UC Irvine (39); UC Santa Barbara (39); CUNY Grad Center (44); Arizona (47); Colorado (47); Michigan State (47); Virginia (47). Physics (Current): UC Berkeley (3); Illinois (9); UC Santa Barbara (10); Michigan (13); Colorado (14); Maryland (14); UCLA (17); UC San Diego (17); UT Austin (17); UW Madison (17); Washington (22); Ohio State (23); Stony Brook (23); Minnesota (25); Penn State (25); Georgia Tech (28); Michigan State (28); Rutgers (28); UC Davis (28); UC Irvine (28); Arizona (37); Florida (37); Indiana (37); UC Santa Cruz (37); Arizona State (44); Purdue (44); Virginia (44); Florida State (47); North Carolina (47); Pitt (47); Texas A&M (47). Political Science (Current): Michigan (4); UC Berkeley (4); UC San Diego (9); North Carolina (11); UCLA (12); Ohio State (15); Wisconsin (15); UC Davis (17); UT Austin (19); Illinois (24); Minnesota (24); Texas A&M (24); Indiana (29); Maryland (29); Michigan State (29); Stony Brook (29); Penn State (33); Washington (26); Iowa (26); Virginia (37); Colorado (40); Florida State (40); Pitt (26); Georgia (45); Rutgers (45); UC Irvine (45); UC Riverside (48). Psychology (Current): UC Berkeley (1); UCLA (3); Michigan (3); Illinois (7); Minnesota (8); UT Austin (8); North Carolina (13); UC San Diego (13); UW Madison (13); Indiana (17); Virginia (17); Ohio State (24); Colorado (26); Iowa (26); Penn State (26); Pitt (26); Washington (26); UC Davis (26); UC Irvine (36); Arizona State (39); Florida (39); Maryland (39); Purdue (39); Stony Brook (39); Arizona (45); Georgia Tech (45); Michigan State (45); Missouri (45); Oregon (45); Kansas (50). Sociology (Current): UC Berkeley (1); Michigan (1); UW Madison (6); North Carolina (6); UCLA (8); UT Austin (11); Indiana (15); Minnesota (17); Ohio State (17); Penn State (17); Washington (17); UC Irvine (23); Arizona (24); Maryland (24); CUNY Graduate Center (28); Rutgers (28); Massachusetts (30); UC Davis (30); Santa Barbara (32); Virginia (32); Iowa (36); University at Albany (36); UC San Diego (36); Stony Brook (40); Colorado (42); Illinois Chicago (42); Michigan State (42); Washington State (42); Florida State (47); Georgia (47); Illinois (47); NC State (47); Oregon (47); Texas A&M (47); Virginia Tech (47).